What Precisely is a Turkey? 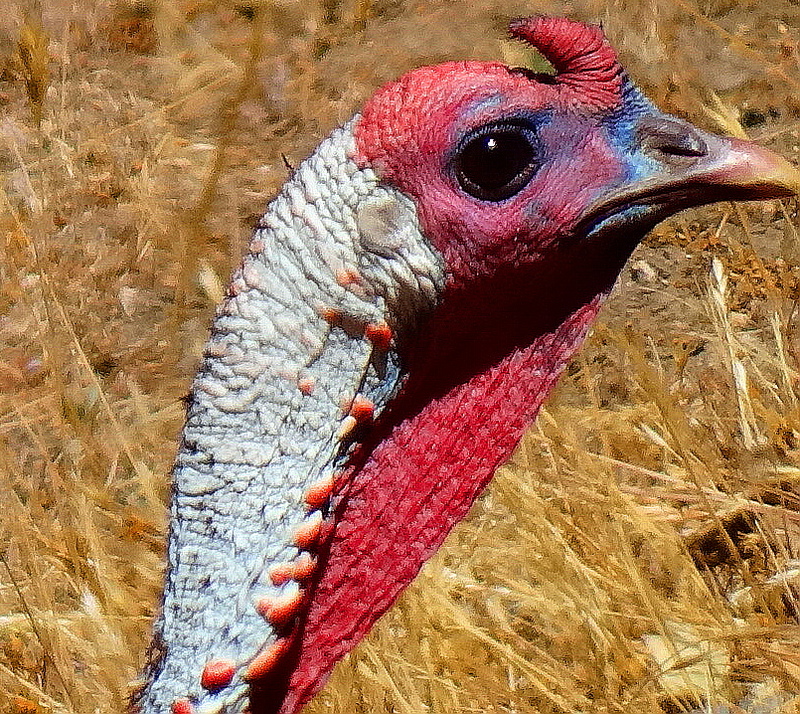 I never thought of turkeys as beautiful. But they are. Aren’t they? 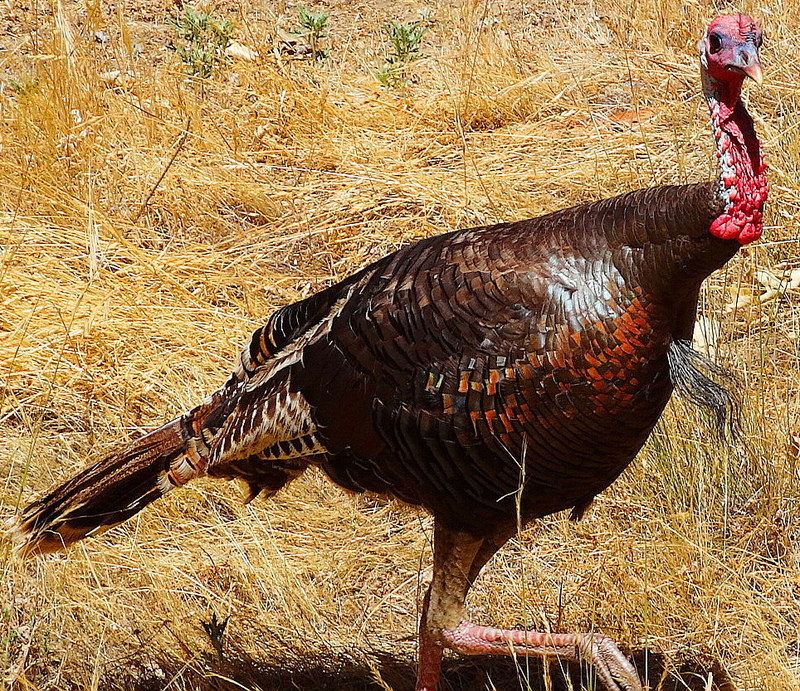 Wild turkeys are a Native American bird. Benjamin Franklin wanted them to be our national bird, but apparently he was out voted, or something……It probably offended Thomas Jefferson’s sensibilities. 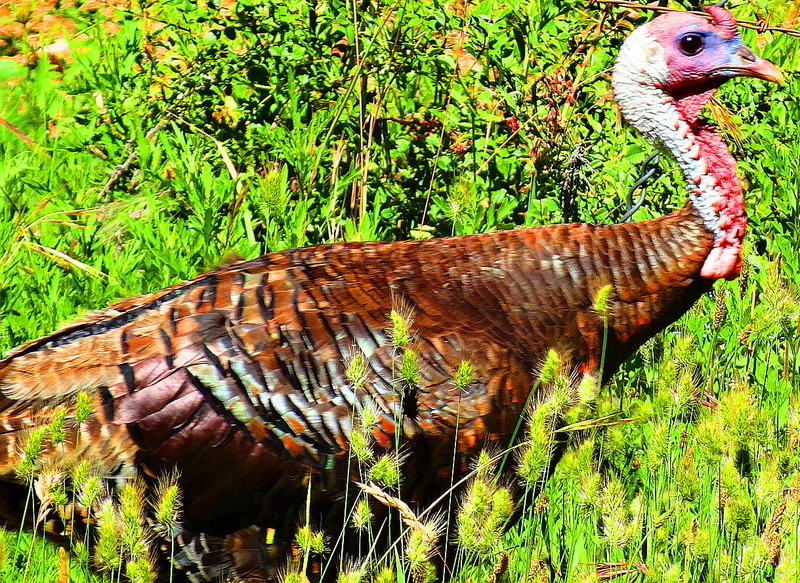 Can you envision a turkey as our national bird? Franklin was definitely an interesting bird himself. Anyhoo, I got into a discussion with my son who is in a grad program in wildlife biology about why wild turkeys have bald heads and necks like vultures. It turns out this is a very complicated matter, basically an issue of morphology (appearance), DNA, and convergent evolution. You’ll have to google it. If your interested in turkeys, that is. Turkeys are in a unique class of Native American bird, similar to the Muschovy duck. Their answer is certain to be wrong. And you can feel smug. And I am very sorry to say this, but they are fine eating too. Here is a wiki link for all of you who are now fascinated by wild turkeys and want to research them in great depth. For the very small few who are not fascinated, well….. just ignore it. Cheers from all the turkeys at The Holler! 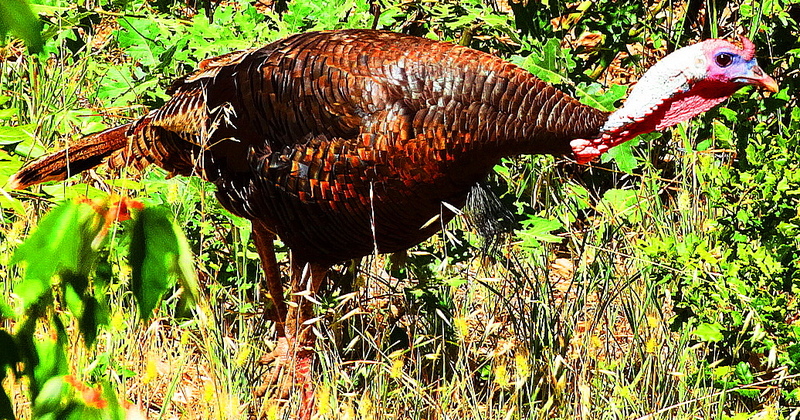 Hmm… turkeys are interesting and good eating, but I just can’t see them as our national symbol! Nope, me neither. I hate to disagree with Benjamin Franklin though…..
AH those Turkeys,how cute they are!Thanks Cindy. Hmm, I am wondering what how that would impact us if turkey became our national bird. Would turkey be included in one of air force symboles ? Can you imagine??? The screaming turkeys squadron????? LOL! Whaaaaa! I miss turkey. The only time it’s in the stores is at Christmas, but if we’re lucky El Rey brings some ground stuff every once in a while. We do have turkey vultures but somehow I don’t think they would taste as good with sweet potatoes and cranberry sauce. 🙂 Great captures once again Cindy! Noooooooo! I wouldn’t recommend baking up a turkey vulture…….Oh course if you did, you could write a fascinating post about it?? Well all the other stuff is actually better the the turkey anyway, the pies, the masked pototoes, the wild rice stuffing, the pies, the ala mode pies……pecan pie, pumpkin pie, chocolate silk pies, pecan stuffed mushrooms, fresh whole cranberries, sweep potatoes, oh and did I mention pies? LOL! And don’t they sound priceless too? Around here they come out in little herds (flocks?) just after it rains. I need to check out your link! Yes the noises they make are hilarious!! You know, except for the pies (see above comment) sweet potatoes, stuffing, fresh cranberries, mashed potatoes, turkey is my favorite dish on TG! LOL! Haven’t heard anyone mention Muscovy ducks since I was about 12 years old ! Should have figured that you’d know about them. Great pics of the turkey. They are so handsome….from a little distance! I feel I want to say ‘ let’s talk turkey’ especially after reading about snoods, wattles, jakes, caruncles, gobbling, spitting, yelping……. Okay you just totally cracked me up!! Hilarious! LOL; I even made myself laugh! I see wild turkeys every now and then. Oh, in fact, my neighbors have turkeys walking around at their backyards, and I hear then everyday. Not sure, but are you sure those aren’t your neigbors instead of turkeys??? Just saying…..I have definitely had turkeys for neighbors, not just at the holler! LOL! He he They have chickens too. The turkeys are loud… but after Thanksgiving Day, it’s quiet in the morning. I wonder why. Actually, I love the sounds that farm animals make, right in the middle of the city. That is cool in the city! People are bringing bits of rural life into the urban jungle, keeping bees, chickens, who knew? turkeys. Do you want a calf? They are so cute. It could start a new urban trend. Bring your cow to class day?? You do need to consider how big they get if you live in a apartment though???? I’m glad it’s June and not November! you know this is precisely the reason i don’t want to see pretty pictures of edible animals. These birds look so beautiful and happy I just don’t want to roast them. Please promise me you won’t click a chicken next…. I’d hate to give that up because your photography made it look just too good to eat. are you tying to sell me to vegetarianis? or worse… veganism? if killing/eating a living organism is wrong, then man would starve to death. Plants are living beings too. And from where I see, our fellow people have to slave harder at planting and reaping crops than they have to work at tending animals. I am not saying raising animals is easy, but compared to the regular hardship of a fruit/veg/grain farm it is a lot simpler. Atleast in my opinion. Heavens no. I eat meat. I just appreciated the wild turkeys. I sell nothing. Always been a pathetic business person…. Definitely more interesting than one origanially thought…..thank you! Especially love the second image. It is a handsome bird isn’t it! Interestingly, I saw a photo of a Muscovy duck today. There are some similarities. Do like that close up. Nice to have a lens with a zoom. I like turkey a lot, especially the sandwiches I get to make after Thanksgiving. Thanks for all the visits and likes Cindy. Appreciate it! Yes exactly Fae! They have families and are quite unusual but handsome birds. Poor turkeys. I love it when turkeys “gobble”! Small children ( and I) find it a very funny sound. Their feathers and colourings are very beautiful. I can tell you that hitting a turkey in your car does as much damage as if you’d hit a vulture. You’re looking at a big bill. I think maybe the only more clueless bird is the Emu. They are just stunningly obtuse. And they are REALLY big……6 feet tall! Aussies are brave!! I wonder how smart ostriches are? You would know Duncan. Pray tell……. There’s so much of the planet on this site. The pictures are so high on impact. Turkeys live and recipes in the same breath! Nice blog. Am new to wordpress and so haven’t had time to visit my favorites, and one of them is this one. Loved your profile page too and the pic! Someone has taken it very well. Will return. Am a ‘follower’ and fan. Who knew? Certainly not me! LOL! Nutty bird, birdy nut, it’s all the same to me. As for the pate, one never thinks of this when they are on a plate! I don’t remember ever seeing wild turkeys here in south western Ontario but this last couple of years they have started appearing in back yards. Last thanksgiving we had about three on the front lawn of our hosts home. We figured they were holding a wake for the one in the oven!